Whelped 3/9 8 pups - 4 male and 4 female. CH Tulemist First Light UD, MH - Flash (CH Risky River Robby MH*** x CH Acampo Grizzly Star UD SH). 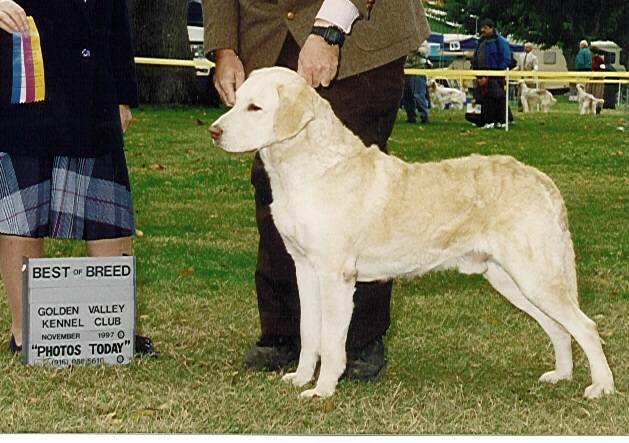 Flash was a pup from my first generation litter, born in 1995. He is a grandson of DC AFC Coot’s Gypsy Clipper MH. 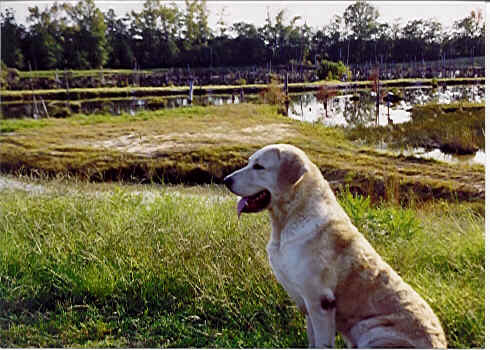 Flash was the first retriever to earn the CH UD MH, AKC title combination. 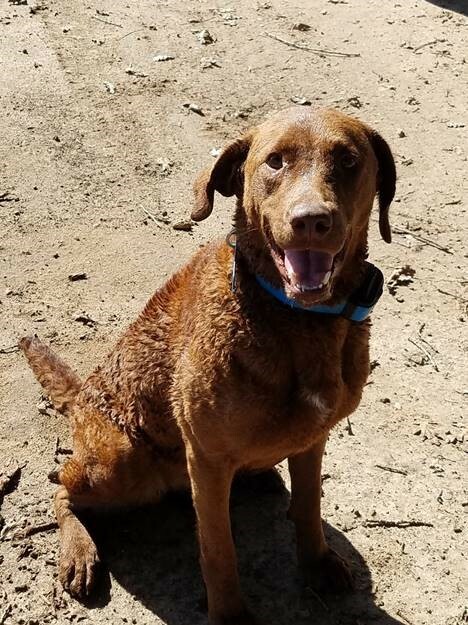 He was also invited to both the Master National Hunt Test and the National Obedience Invitational Trial; also I believe a first for a Retriever. 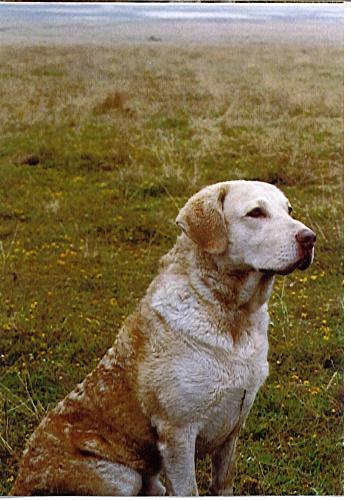 He competed in the 1999 and 2000 Master National Hunt Tests He was a light deadgrass dog with very minimal markings and weighed about 80 pounds. 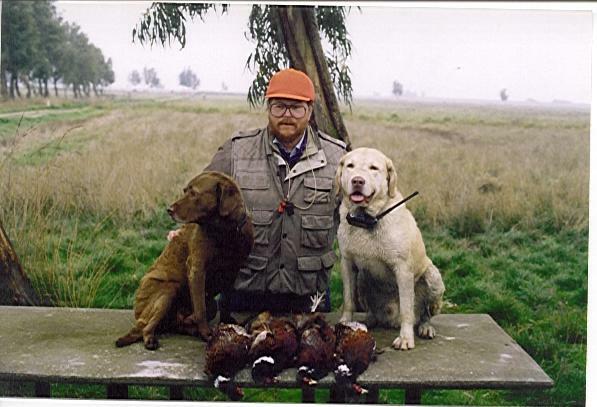 He had an exceptional temperament and was a fantastic pheasant dog. Tulemist Golden Opportunity SH - Goldie (CH Quail Run's Two Buck Chuck*** x CH LPK Rubicon River Red CDX MH**) Goldie was whelped October 2013 and was returned to us at 1 year of age when the original owner no longer wanted her. She is a dark sedge color with a small white blaze on her chest. She has 16 show points (15 required for a Championship) but is lacking her major win (a win of 3 points or more)- The west coast has had very few major shows in the last couple years. She is a granddaughter of DC, AFC Westwind's Rudy of Nordais. This will be Goldie's second litter; the first being to AFC Distigon's ATV of Nordais (Hummer) whelped July 10 2017. 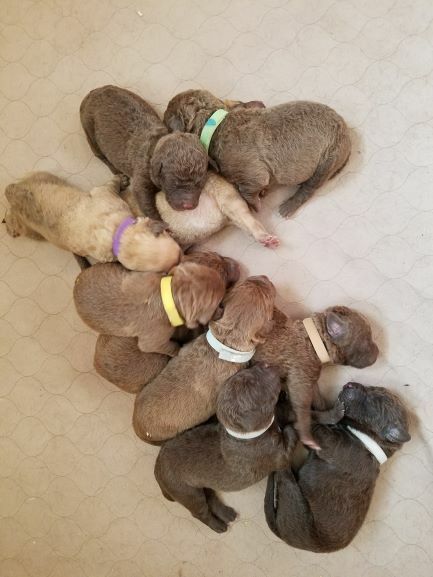 That litter produced 2 deadgrass pups even though Hummer is brown, so I am expecting that this litter could produce all 3 Chesapeake colors. 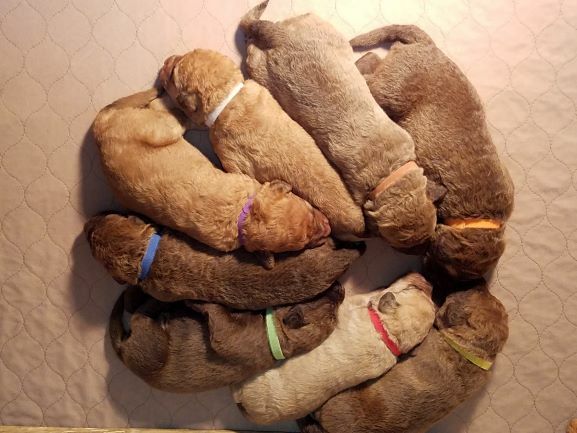 Since Goldie is clear of the DNA genes that produce PRA, EIC, and DM, the pups from this litter will not be effected by these diseases. The pups will be DNA tested to determine their carrier status for these diseases at the time their dew claws are removed (about day 4). 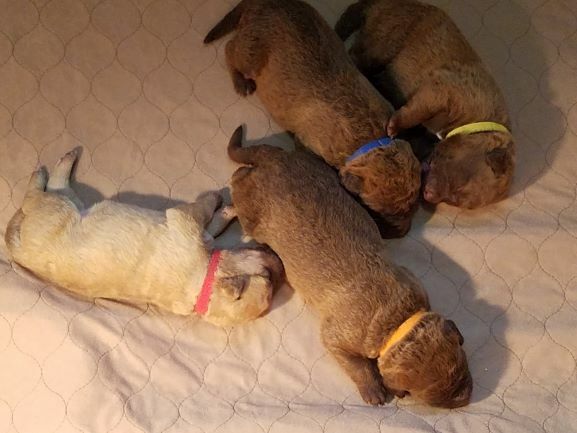 Pups will have dew claws removed, be microchipped, be DNA profiled for the PRA, DM, and EIC genes with results registered with OFA. The pups will also have a veterinarian health check and be current on all puppy shots prior to placement. As part of our early puppy rearing, the pups will be introduced to birds, water and will be well socialized. 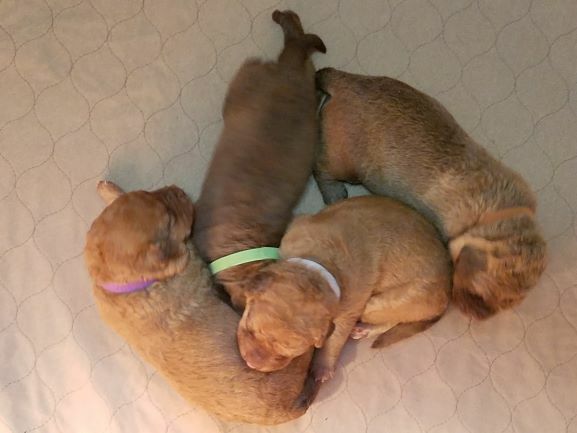 All pups come with full AKC registration privileges. Price is $1500 plus any shipping costs if required. 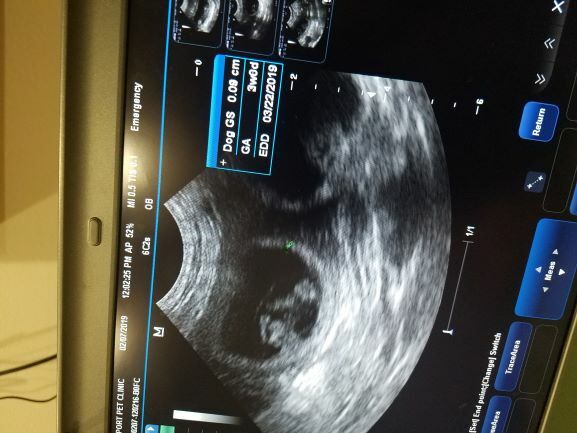 Expected due date is 3/10/19. 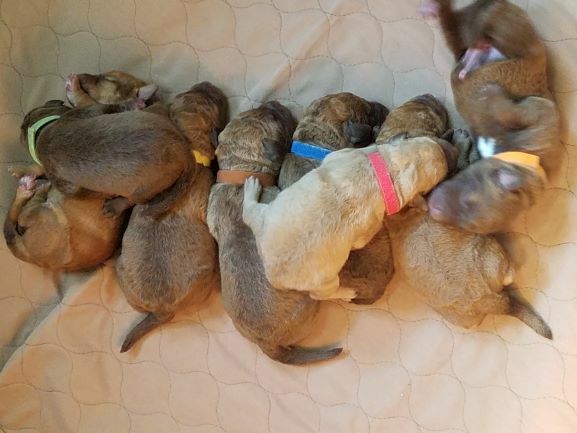 For more information on this litter contact Tom at tom@tulemist.com or visit the website http://tulemist.com. 2 weeks old today. Dew claws have been sent to Paw Print Genetics for DNA profile for the EIC and PRA gene. Results are expected in 2 weeks. First de-worming done this morning. Eyes are now open. One male still available.